FLINT, Mich. – Dr. Amy Saxe-Custack, assistant professor of food science and human nutrition in the Michigan State University College of Agriculture and Natural Resources and nutrition director of the MSU-Hurley Children’s Hospital Pediatric Public Health Initiative (PPHI), will present results from a new study at the American Society for Nutrition annual meeting, Nutrition 2018, held June 9-12, 2018 in Boston. The new study Dr. Saxe-Custack will present shows that a fruit and vegetable prescription program can improve access to healthy foods for underserved children. In August 2015, the Hurley Children’s Center - Sumathi Mukkamala Children’s Center, a residency training pediatric clinic associated with the MSU College of Human Medicine, relocated to the second floor of the downtown Flint Farmers’ Market. 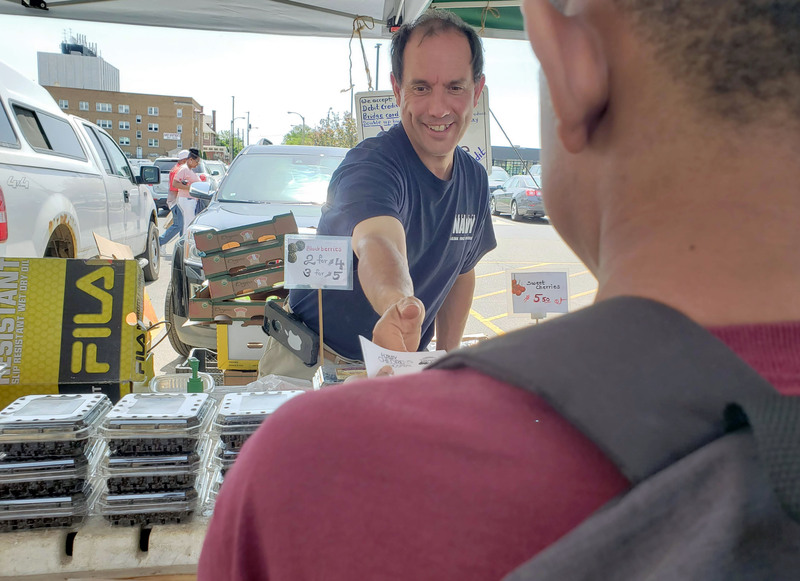 Immediately following, the clinic and the farmers’ market created a program to encourage families to shop at the farmers’ market by giving pediatric patients $15 prescriptions for fresh fruits and vegetables that can be redeemed at the market. Flint is considered a food desert because of limited access to full-service grocery stores within city limits. About 60 percent of the city’s kids live in poverty, and many children don’t consume enough nutrient-dense foods while also eating too many poor-quality, calorie-dense foods. Dr. Saxe-Custack and her PPHI team recently received a $500,000 grant from the Michigan Health Endowment Fund to further their work. This grant will help to expand the prescription program in Flint and to evaluate its impact. With this funding, they will partner with Flint Fresh Mobile Market and allow families to redeem their prescriptions at either the Flint Farmers’ Market or at Flint Fresh Mobile Market, which includes online or telephone ordering of locally-grown produce boxes delivered directly to people who live or work in Flint. This expansion will help the researchers to create a model program that may be replicated in other areas. Dr. Amy Saxe-Custack will present this research during the Community and Public Health Nutrition Challenges and Interventions on Tuesday, June 12 in Boston. For more information about Dr. Saxe-Custack presentation visit www.nutrition.org. Nutrition 2018 is the inaugural flagship meeting of the American Society for Nutrition held June 9-12, 2018 at the Hynes Convention Center in Boston. It is the national venue for more than 3,000 top researchers, practitioners and other professionals to announce exciting research findings and explore their implications for practice and policy. Scientific symposia address the latest advances in cellular and physiological nutrition and metabolism, clinical and translational nutrition, global and public health, population science, and food science and systems. www.nutrition.org/N18 #Nutrition2018.